Sun and clouds mixed. High 74F. Winds W at 15 to 25 mph. Higher wind gusts possible..
From the time she was a small child, Elizabeth McNeilly knew she wanted to ride and train horses when she grew up. Today, McNeilly is fulfilling that dream by operating her own business, Equus & Paws LLC. The business offers grooming services for pets, but she has also branched out to provide a variety of animal care specialties, including equine and pet massage. 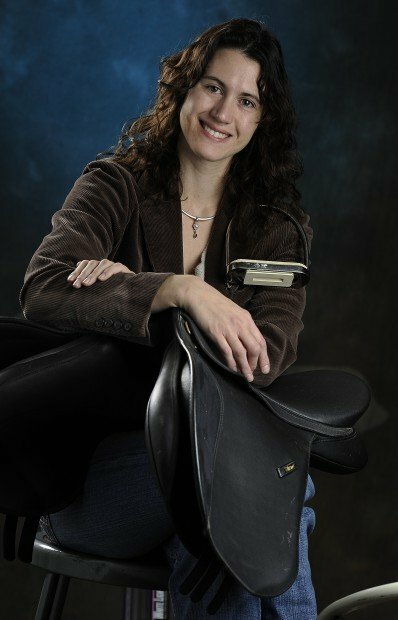 McNeilly attended the equestrian program at Rocky Mountain College until health issues forced her to take a break from college. But she reinvigorated her love of animals by completing an equissage (horse massage) program in Round Hill, Va.
She followed that up by completing training at the Rocky Mountain School of Acupressure and Massage in Denver. She also attended a dog grooming program in her home town in Delaware, and later decided to return to Billings to set up her own business. Massage reduces pain, improves flexibility and helps horses and dogs stay calm, McNeilly said. "If a horse is a little head shy, massage can really help them out. It's fantastic for people who show their horses because it helps horses relax and concentrate," she said. Describe how you got where you are in your career:"After I attended the massage classes, I decided to come back to Montana because I love living here. I have developed a pretty decent clientele and I have some wonderful clients. What's the toughest challenge in your business? Finding advertising that works. While the shop is on a busy street, many people use Broadwater as a through street rather than visiting the businesses on it. While signage helps, I've had to find other ways to draw people into the business. I also realized that I have had to change things around in my business. If you could make one positive change in Billings, what would it be? I would like to teach more kids how to ride. I would also like to improve animal care by working with other professionals. Which living person do you most admire? Oprah Winfrey. What do you consider your greatest achievement? I have been able to run a successful business, even though I have epilepsy. I never let the disease get me down. I'm happiest when... I'm riding my horse. Here's how I relax: Ride my horse every evening after work.